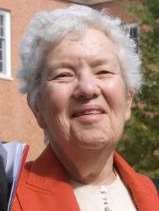 Among all the more famous deaths of 2016, I want to mention Vera Rubin. She was the only person graduating with an Astronomy degree from her class in 1948. She wanted to do her PhD at Princeton, but they didn’t accept women for post grad studies at the time, so she went to Cornell. That’s where she discovered that galaxies didn’t seem to be flying straight out after the Big Bang but rather rotating around something-or-other. She couldn’t get the research published, because her theory was highly ambitious and her data was “too skimpy”. At the time very few people had access to telescopes, so she had to use data published by other people. She presented her thesis at a meeting of the American Astronomical Society in 1951, when her son was weeks old. I had these two professors at Cornell, the two people in the department who knew what I was doing. Probably late in the fall, the department chairman said that in as much as I was going to have a child and therefore couldn’t go to the meeting to give this talk, he would give it, and in as much as I wasn’t a member of the AAS [American Astronomical Society], a member’s name would have to be on the paper. He really had nothing to do with what I had done. In case you didn’t catch that, her professor was proposing to take half the credit even though he hadn’t done any of the work. Rubin spent much of the 1970s studying the rotation of individual galaxies and fund they were spinning so fast that they ought to be flying apart. The only way they could hold together at those speeds would be if there were much more mass than the visible stars. Essentially, she proved that dark matter exists, and there’s a heck of a lot of it – 84% of the matter in the universe. This also explains the motion of galaxies within galaxy clusters – the oddity she noticed in the 1950s but couldn’t prove because she couldn’t get enough data. It also shows that what we can see is just the tip of the iceberg. The New York Times described this as “a Copernican-scale change in cosmic consciousness,” and a lot of people think she should have got the Nobel Prize for Physics for it. She died on Christmas Day, aged 88.